In my previous entry I made reference to having to review a document that had the potential to crush my soul. Alas, I regret to report that my soul has been crushed. It has now fallen to me to re-write the soul-crushing document. In the long run, this is probably a good thing, since I think I can turn it into a document that will not crush other people's souls. But in the short run, it's not so good, since I must continually read and think about soul-crushing administrivia. How does one recover from reviewing a draft of a document that threatens to nullify all that is joyous and bright? I'm not sure. But I am developing some empirical evidence that beer and ice cream help, and that mediocre mashed potatoes and agenda-less meetings don't help. I've also found it quite therapeutic to listen to Goats CDs at almost painful volumes while driving to and from campus. Back to Calculus grading. I'm almost done with my batch for the weekend. Then I get to devote my full attention to making the soul-crushing document safe for others to read. I received 122 emails. And it's only 7pm. More are no doubt on their way. I have 153 messages in my inbox. I have 25 calculus assignments to grade. I ran 3.2 miles. Very slowly. I have six Complex Systems assignments to grade. I should have more. I am very hungry and it is time to go home. While I was typing this little blog entry I received and sent one additional email. I need to review a reaccreditation document tonight that I fear will crush my soul. I must go before more email comes and swamps me. There is no longer any doubt that the term has started: I've got piles of grading to do. Twenty-three Calculus assignments and ten Complex Systems assignments. This will be the situation for the next nine weeks. Now that I've started the grading ritual, it is clear that I'm in the midst of fall term. However, as far as the weather goes, it's still surprisingly summery. This weekend was warm and clear, and I was able to go for a bike ride both Saturday and Sunday. Saturday I did a load of laundry, and it dried quickly on the line. Also on Saturday I did a lot of filing and straightening in my office on campus. It was quite satisfying. The cosmos and snapdragons in our yard continue to pump out flowers. There is still one hummingbird at our feeder, but I suspect it will head south soon. About two weeks ago I posted about a thank you gift from MapleSoft that seemed somewhat amusingly lacking to me. In brief, the situation was that the College spent around $2000 to upgrade Maple, and as a thank you they sent me a kinda mediocre poster and then offered to send me more of the same mediocre poster if I wanted. This was a nice gesture, but didn't suggest to me that the poster was limited-edition collector's time. My post was meant almost entirely in jest. I like Maple and everyone I've ever spoken to at MapleSoft (the company that makes Maple) has been extremely pleasant in an earnest, Canadian way. The box contained a nifty tote bag, pictured above. It's a nice, and appears to be quite well made. There's a little bit of velcro to help it stay closed, and it has a nice outer pocket. I'll definitely be able to put this to use. Also shown in the picture are three nice ball-point Maple pens. Also definitely useful. Maple also sent me a nice, 100% cotton Maple t-shirt. The photo above shows the back. The front is also quite nice; it has a small Maple logo that's embroidered right on the shirt. Quite cool. But there's more. 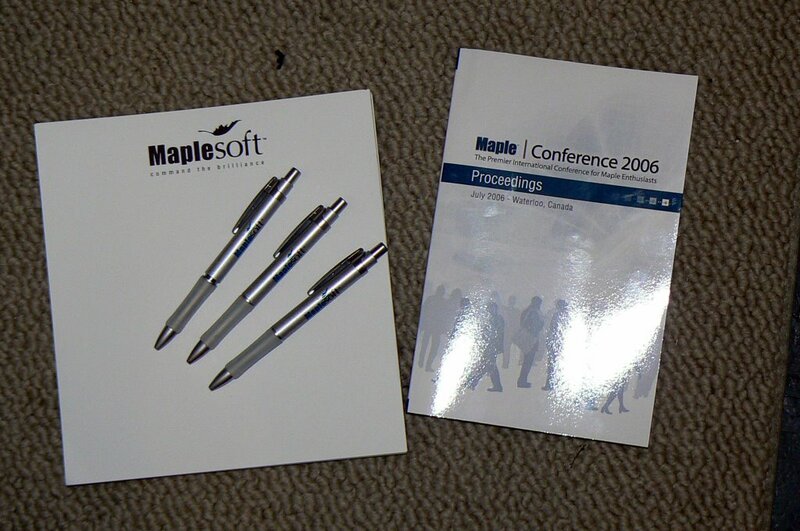 The MapleSoft folks also sent me a large notepad and a copy of their conference proceedings from the last Maple conference. I also got a small magnet that will stick to a refrigerator or filing cabinet and hold onto a piece of paper. And last, but certainly not least, MapleSoft sent me a nice blue water bottle. It even has a little plastic strainer that fits in the lid so that I could use it for tea if I wanted. I was stunned to receive the box. It's hard to capture my feelings when I opened it. It was a mixture of joy, sheepishness, and a sense of the surreal. It's not unusual for me to feel that my life is a little surreal or bizarre. Usually this is a not-so-good-feeling, but opening the box of Maple paraphenalia was a good sort of surreal feeling. I'm genuinely touched by the gesture. The cool Maple stuff was accompanied by a nice, humorous note from one of MapleSoft's vice presidents. 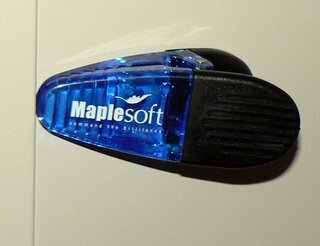 So, a big thank you to all the folks at MapleSoft. Your box of Maple items was definitely a highlight of my week. I'm sorry I didn't get a chance to blog about it sooner; the first week of classes was remarkably hectic. I hope all is well in Waterloo. Here in Maine it's been a beautiful autumn. Last weekend I was emptying the compost and, as is often the case, there were lots of things growing in the compost pile. There were many weeds sprouting and also a few potatoes. But then I noticed something unusual. Turns out that a mango seed had sprouted and had produced a shoot that was around a foot tall. I thought this was really cool. 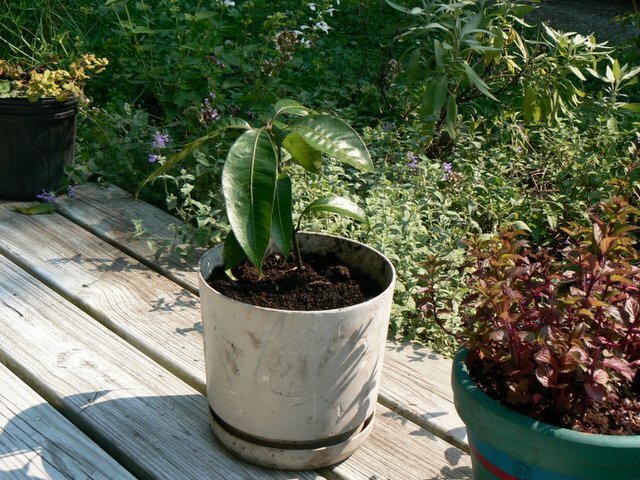 There have been many mango pits in the compost before, but none have ever sprouted. So I dug up the mango plant and put it in a pot with a bunch of potting soil. It seems to have survived its transplanting just fine. Below is a picture of my little mango tree that I took this morning. Something ate part of one of its leaves, but other than that it looks very happy. Soon, however, I'll need to take the mango tree inside; tomorrow night it's supposed to get into the low 30's. I'll try to keep the mango tree alive indoors through the winter. I'm not great at keeping plants alive, so I'm not optimistic. But I figure it's worth a try. In other news, we're done with our first official week of fall term. I think both of my classes are off to a good start, although it's far too early to tell. The week was surprisingly hectic, but basically positive. When I left my office on Friday my email queue was at 99, about the same as it was at the start of the week. Friday alone I dealt with around 125 incoming messages and sent almost 50 emails. Today was a day of exercise, doing stuff around the house, having a nice dinner with friends, and doing some reading. Tomorrow will need to be a more serious day of work. Ok. So it's been an interesting day. And by interesting I don't really mean "fascinating", but more "interesting" like how it can be sorta interesting when you get a blister someplace that you don't usually get one. So there are a number of things I'd like to rant about. I'll choose to rant about the thing that is least likely to get me in trouble. I'm still going through some of the snail mail that accumulated while I was away for seven weeks. The last piles I'm going through are those items that I immediately identified as being junk mail and/or not requiring any action on my part. 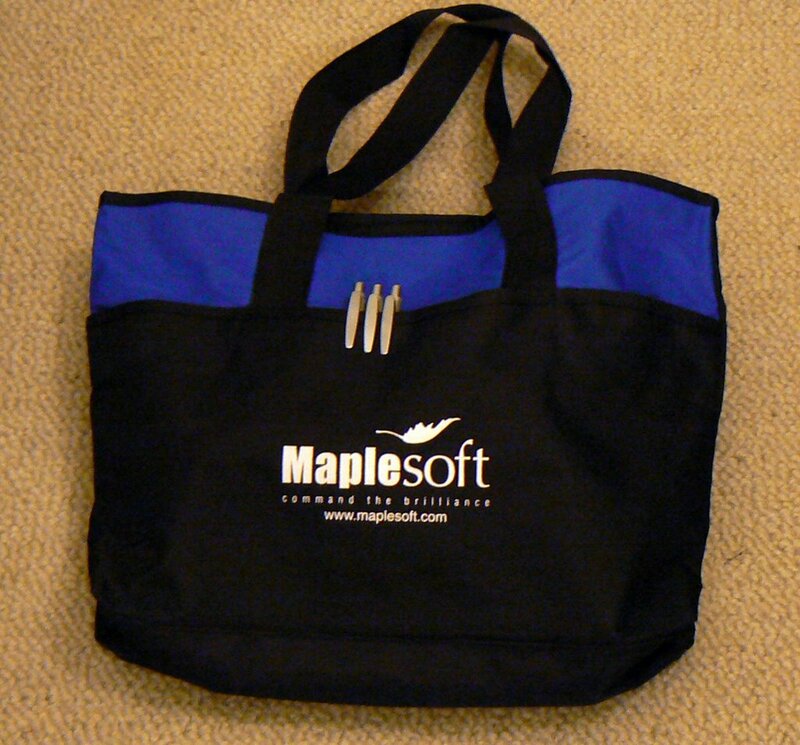 One of the things I went through today was an 8.5 x 11 envelope from Maplesoft., a software company that makes the program Maple. 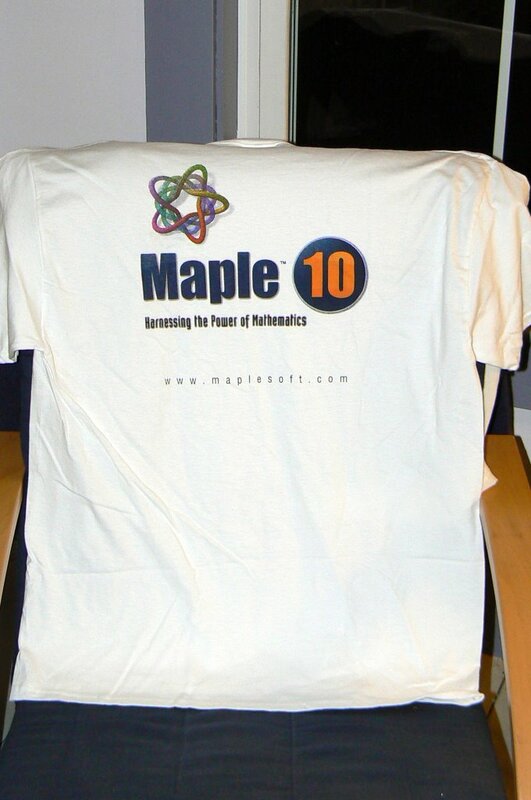 Maple is a computer algebra system that I use for many of my math classes. It's a pretty good program. Overall, I'm quite pleased with it. I wish there was an open source alternative to Maple, but there isn't, at least not one that's sufficiently user-friendly for my introductory students. Anyway, I believe we recently upgraded our site license. I think this cost us around $2000. Our site license is small because we don't have many students. I'm sure Maple costs a lot more at bigger schools. Anyway, this letter was a thank you note. Included in the envelope was a free poster detailing the history of the western units. It has information about inches and centimeters and furlongs and such. The poster is ok, but not particularly snazzy. Hardly a collector's item. So we spend $2000, which means Maple gets $2000. And they thank us with a poster about the metric system and other units? Why bother? A small thank you note would be more than sufficient. But if you're going to give a gift, give a real gift. It doesn't have to be anything expensive. Perhaps a keychain or a T-shirt or a little flash drive or some free socks or something. Maybe it's just me, but a poster about units of measurement just doesn't seem right. And ironically enough, the date on the letter coincides with my birthday. But then the letter continues, "If you'd like to obtain more posters, I'd be more than happy to send extras to you at no charge." On the one hand, this is nice. But on the other hand, it does nothing to convince me of the preciousness or specialness of the poster. Here, have a very special poster. They're so very special that we'll give you unlimited additional copies for free. Somehow this doesn't leave me feeling warm and fuzzy inside. In fairness to Maplesoft, (and in case anyone from Maplesoft reads this blog) I should mention that they've been great to work with. Their salespeople are helpful, knowledgeable, and extremely pleasant. And I think their product is a good deal and has worked very well for us. So despite this rant, I don't harbor any ill feelings toward Maplesoft. But I do think they might want to rethink their "spend $2000 and get a poster that is so special we can't give them away fast enough" policy. That's enough of a rant for this evening. Writing this while listening to a dumb Alice DeeJay CD at wall-shaking volume seems to have lightened my mood. Sound intensity is measured in decibels. And if I want to learn about the history of decibels, now I have a poster that will tell me all about it. Yay. This morning I welcomed the new students to campus and shared with them some thoughts about College of the Atlantic's academic philosophy and mission. We have many different goals for new student orientation at COA. We want students to get to know each other and staff and faculty, and of course we need to tell students about academic requirements and policies and such. But the purpose of the session I spoke at was to try and set the tone for academic work at the college and to talk about our educational philosophy and shared beliefs. I've done this for four years now, and I enjoy it. Preparing the talk was a difficult but fun exercise. The first time I gave the talk was an enormous amount of work, and each year I spend a lot of time thinking about what I'm going to say and how to say it. I've pretty much given the same talk every year, although I continue to refine it. Although I don't usually do so, for this presentation I wrote out my comments almost word for word. I had too many different thoughts and I didn't think I could do a good job improvising as I normally do when teaching or giving research presentations. My remarks from this year can be found here as a pdf file. (If the pdf file doesn't work, drop me an email or leave a comment and I can convert to html.) I think it works much better as a speech than a piece of writing. But nevertheless it might make interesting reading. I freely admit that it borders on a being little too sentimental or melodramatic. But I'd like to think that this sort of thing is ok once or twice a year. I think that teaching at a college, especially one like COA, is important work, and attending college can be powerfully transformative. This talk/essay is an attempt to articulate why I think this is the case. This post is mainly to test picasa's ability to take pictures from my hard drive and blog them. Thus far, I'm only moderately impressed with Picasa. It seems nice, but it's taking a ton of CPU time. It seems like it spawns a half dozen processes. But it does appear to be potentially quite handy. 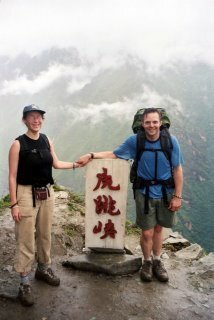 The picture below is from the summer of 2004 when Doreen and I trekked Tiger Leaping Gorge near Lijiang in Yunnan, China. Fall in academia, at least that portion of academia that teaches students, is like spring in the rest of the world. It's the season when there's a sense of renewal and hope. New students appear on campus ready to learn. Fall term is when I most look forward to my classes. I have a lot of energy, I'm not tired from the previous term, and the students are usually at their most energetic, too. Sometimes spring arrives slowly: one spends weeks watching buds gradually appear on trees and then open up gradually over the course of a month. But other times spring seems to appear all at once: all of a sudden there are crocuses blooming in the yard, or you notice that it's still light out after dinner. The same is true of fall and the "back to school" season. Sometimes there's a long countdown, and other times it feels like a bit of a surprise. The latter occurred on Sunday when I greeted parents of new students. We hold a brief orientation session for parents and families of new students on "move in" day. While the students are off getting organized for their outdoor orientation trip, we gather parents together, welcome them into the College of the Atlantic family, and answer any questions they might have. This is the fourth year that I've taken part in this event, and I enjoy doing it. I remember the first year I spoke to parents. I had prepared a few introductory and welcoming comments. I was a few minutes into my remarks and I noticed that some folks in the audience were looking sort of strange -- a little green or something. I've given a lot of talks, including quite a few to parents, and taught a lot of classes, but this look was one that I didn't recognize. Not being very clever, I couldn't quite figure it out. Then I saw someone with tears in her eyes, and I got it. For whatever reason it hadn't quite occurred to me how emotional a day it can be for parents when they drop their sons or daughters off to college. Anyway, on Sunday I again found myself speaking to parents of new students, and again I saw all sorts of emotions on the faces of the audience. Just two days earlier I had returned from China. In one sense, I was prepared for the presentation; I've done this before and I knew what I wanted to say. But in another sense, it caught me a little bit by surprise, like when one sees crocuses in late winter. It's not unexpected. We know that flowers come in the spring and that the academic cycle starts again in late summer or early autumn. But it nevertheless can be a surprising moment to actually see the crocuses. One of the reasons I like talking to parents of the new students is that it serves as a really good reminder of the importance of many components of my work teaching and administering at the college. It's increasingly common to speak of our students as customers. And this is, in a sense, certainly true. And I also sometimes think about how much college costs, and how this gives us an obligation to do the best possible job for our students. But all of this seems trivial when I think about sixty or so parents looking at me while I promised them that the rest of the faculty and I would do our very best for their children. The parents' expressions showed a mix of concern, hope, pride, sadness, joy, and love. I wish all faculty -- at COA and elsewhere -- could share the experience of talking with the parents of new students on "drop off" day. The leaving-for-college transition is an interesting one. It's a big deal. I think back to when I left for college. I wasn't dropped off at school by my parents, as I lived too far away. Instead I grabbed a cab to the airport and flew to Minneapolis. I don't remember too much about the particulars of the day. But I do remember a general sense that I had a clear opportunity to re-invent myself. Or, perhaps to have myself re-invented by a new group of friends and peers. I had attended the same small school from 4th to 12th grade. For the most part, my social standing and the cliques I hung out with hadn't changed since 5th grade. So there was something tremendously liberating -- and a little frightening -- about being in such a new setting. It was a totally clean start. In one's life there are probably only a few such instances where one gets a fresh start in this way. I can count only three in my life, and I doubt any more are coming. Although I have no direct experience with it, I'm sure that having one's son or daughter go off to college must be an exciting and difficult day. A friend and colleague will be dropping her oldest son off at college this week. I've talked with her some about it and I think it will be a very happy day, but a day of complicated feelings. Later today I will again greet and talk with parents of new students, this time the parents of those students who did not participate in our outdoor orientation program, and hence are arriving on campus and moving in today. This will be a smaller group than last week, as the majority of entering students have already arrived. The students from outdoor orientation return from their trips today, and over the next few days returning students will start trickling back to campus. Monday and Tuesday are orientation, Wednesday convocation and classes start Thursday. Although I'm not quite ready for it, I'm nevertheless looking forward to getting into the routine of the academic term. Last month Doreen was interviewed by David Ballard on Gettin' Down to Busine$$, a relatively new podcast on http://www.yakkyakk.com/. The episode she was interviewed on is called "Organic Food vs. Factory Farms and GMO's." I think the podcast is dated July 27, 2006. If you can't get the podcast at the above links, here is a direct link to the mp3 file. The file is around 18 MB. It's not the most scintillating interview/podcast I've ever heard. There were two guests, and the interviewer would pose general questions and it wasn't clear who he wanted to answer. Nevertheless, it's reasonably interesting. There's not much news in Bar Harbor and Mount Desert Island. The weekly newspaper, which I enjoy and which a friend and colleague writes for, is a pretty quick read. One of the parts of the paper I always at least skim is the "Police Beat" column. As is pretty standard, I suppose, these are short items picked up from police reports the during the previous week. Reassuringly, most of these items are completely trivial: the paper will often print who got speeding tickets that week, and occasionally report on non-events such as someone calling the police because they thought something was stolen from their house and then calling back 15 minutes later to say that they were mistaken and that the supposedly stolen object has been found. This stuff actually gets printed. Today, though, something new: there was a brief mention of someone who was given a ticket for not wearing a seatbelt. Surely, even in Bar Harbor, something more important is going on.